BRUSSELS — Afghanistan’s recent peace deal with a notorious warlord could be a model for reconciliation with the Taliban, U.S. Secretary of State John Kerry said Wednesday, imploring the country’s former leaders to lay down their arms so U.S.-led military forces can leave. Speaking at an international conference on Afghanistan, Kerry said the Kabul government’s agreement last week with Gulbuddin Hekmatyar requires his commanders to cease violence, cut ties with terrorist groups and accept the Afghan constitution’s rights for women and minorities. In return, Hekmatyar, a man once dubbed the “Butcher of Kabul,” can rejoin Afghan society. 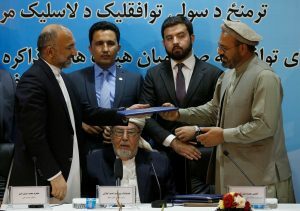 The Sept. 29 peace treaty was Afghanistan’s first since the Taliban’s overthrow in 2001. Hekmatyar is believed to have killed thousands of Afghans in sustained rocket attacks on the Afghan capital during civil war in the 1990s. The U.S. declared him a “global terrorist” in 2003. The U.N. blacklisted him the same year. Both are considering lifting sanctions. The United States has been promoting reconciliation as part of its strategy to remove American troops from Afghanistan. But efforts have shown little momentum, beset by divisions within Afghanistan’s government and the Taliban. President Barack Obama has ordered 8,400 U.S. forces to remain in the country though 2017, unable to fulfill his promise to end America’s involvement in the war. Hekmatyar had lived for the last two decades in exile. He is widely disliked and distrusted by ordinary Afghans for his past extremism, including support for al-Qaida. Human Right Watch has branded him “one of Afghanistan’s most notorious war crimes suspects” and said his return would “compound a culture of impunity” that has denied justice to the many Afghan victims of violence. Under the peace agreement, Hekmatyar and his followers received immunity and full political rights. Afghanistan has been mired in conflict for decades. The U.S.-led intervention after the Sept. 11, 2001, terrorist attacks sent billions of dollars into the country, creating a false economy with double-digit growth. The economy tumbled as troops drew down in 2014 and many aid workers and international agencies departed or scaled back operations. Unemployment may be as high as 50 percent. Insecurity throughout much of the country has deterred investment and driven many Afghans to Europe as migrants. At the Brussels conference, Western countries were expected to pledge more than $3 billion in development aid through 2020.